Yesterday, we explored Gumtree’s “death by a thousand papercuts” crisis. Today, it’s a crisis that got the whole country in a flap…. 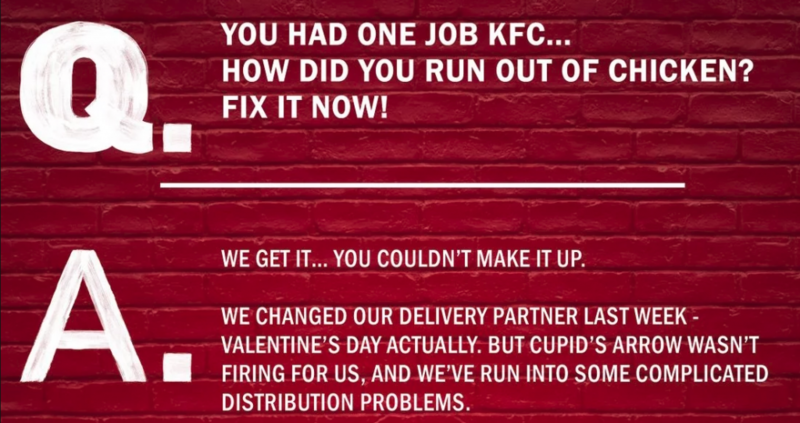 “You may be aware that we had a little bit of an issue earlier this year”, began Jenny Packwood, head of brand engagement for KFC UK & Ireland. The KFC chicken crisis saw 750 stores out of the company’s 900 stores in the UK and Ireland closed with 19,000 team members affected. Jenny explained that in the eye of the storm, the media team took 321 media enquiries (half of what they’d normally get in a year) in just seven days. 80% of UK adults were exposed to the story and it was on the news at ten every night for a week. 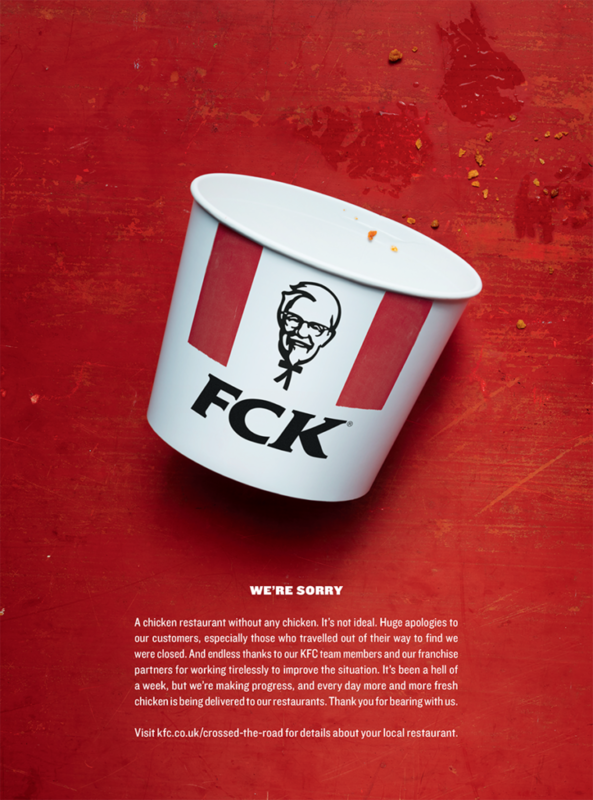 So how did KFC build up the courage to buy a full page advert with an almost-swear word in national newspapers nine or ten days into the crisis and how did they turn a real crisis into a success story? The chicken crisis was a perfect storm for the media. It was prime for chicken puns (Jenny has now heard every one of them now) and it was driven by the fact that it involved all sectors – there were food wastages, unions were involved, politicians got involved, people even called 999 because they couldn’t get their chicken! The story was moving onward “like an uncontrolled beast”. Other brands got involved and started piggybacking on the story, memes flooded the net, new angles were being thrown at the media team constantly and one woman on the news even said she’d have to go to Burger King instead (seriously, you’d go to Maccies before Burger King, wouldn’t you?). So what did they do about the rapidly escalating crisis? Another key part of their response was to tackle the problem head on and not to fudge it or shift the blame “even though there was an obvious place to shift it”, she said. “We put out hands up and that provoked good will from the media and the public”. All of this work led them to “the FCK bucket”. While one team in the media office was working on the immediate responses to the media, another group were thinking about their next steps and working with external PR agencies and one of them came up with the idea for the bucket. This is one of the best approaches to take in a crisis. Sometimes the instinct is to shink away, say nothing and hope it’ll blow over, but that enables the media and the public to fill the vacuum with a narrative that you can’t control, which might be inaccurate and which will almost certainly be unfavourable. Instead, the best course of action is to be open, honest and proactive. Behind the scenes, Jenny jokes that “F**k” was what they were all saying all the time, so the FCK Bucket was a perfect fit for them, it put their message in the headlines instead of more negative alternatives and it disarmed the issue. Jenny makes it clear that not every company could get away with putting an offensive word on a billboard, but she says it was right for KFC as it suited their voice. She also explains that the team couldn’t have done it without having a very integrated agency and marketing model, a defined voice and style that they’d built up and the full backing and complete trust of the company’s managers. The decision took guts and Jenny said they were all terrified behind the scenes, but they felt that, after thinking about the bucket for 48 hours, they were on top of the issues and the timing was right. And what’s the main message on the advert? (aside from “FCK”)… “We’re sorry”. Not every business or public body has the guts to say that word, mostly because of the belief that it will somehow be viewed as an admission of guilt. This is one of the things that will be addressed in our next blog when we find out how to slay the three “crisis demons” and the power of saying “sorry”.